The 39-year-old former navy blues goalkeeper and assistant coach announced his unavailability for the next campaign to club officials today. “I have come to a big decision that I will not be back this season as assistant coach at Auckland City. It is not a decision I have taken lightly and it has been one of the hardest calls I have had to make in my football life,” Gothard said. “But after four seasons with the club I feel it is now time for me to spend more time with my family and concentrate on them and my job of selling houses,” he added. Gothard joined Auckland City in 2009 playing in the navy blues epic final match at the FIFA Club World Cup in the UAE as they swept to a fifth placed finish by memorably defeating the African club champions TP Mazembe. He stepped into the goalkeeper coaching role the following season while also remaining part of the playing squad before accepting the assistant coach mantle after Aaron McFarland stood down to pursue his international coaching career. 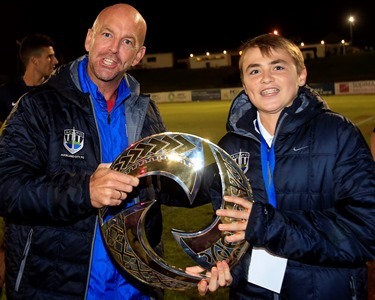 Auckland City won the OFC Champions League for the third time in a row last season and qualified for the FIFA Club World Cup in Morocco scheduled for later this year. Sadly, Gothard won’t be part of the club’s return to world club football’s top table next December in Morocco. “Auckland City is a great club and the people involved there are great people. It is like one big family and I will miss everyone badly. “I have learnt so much during my time with Auckland City. Ramon Tribulietx has taught me plenty and I’m pleased to call him a good friend now. I wish him all the very best for the upcoming season,” Gothard said. Gothard said chairman Ivan Vuksich and head coach Tribulietx were disappointed to hear of his decision but understood the reasons around it. “Everyone has been very understanding and I would like to thank Ivan and the board for all their support during my time at Auckland City. “I will miss the day to day coaching at the club and will miss the players and supporters who have been fantastic both on and off the field. “Again it is not a decision I have made lightly but at this stage family must come first. “I will be watching the team’s results keenly and hopefully one day I may be able to get involved again…never say never!” Gothard added. Vuksich was shocked and disappointed to hear of Gothard’s decision. “Goffy has been an integral part of the Auckland City setup since he joined the club in 2009. He has filled a number of different roles during that time as a player, goalkeeper coach and assistant coach and has made a significant contribution to the team’s success. Gothard’s replacement will be named in due course and will join the team’s management staff which remains largely unchanged from last season. Auckland City FC has confirmed several management staff appointments for the next campaign with Ramon Tribulietx remaining as head coach. Simone Naddi steps into the role of goalkeeper coach after replacing Grant Robertson toward the end of last season, while Craig Panther (club doctor), Arthur Egan (Property Steward) and physios Andrew Newmarch and Tim Read also return.